Review: Obviously, I couldn't finish this book. I have read two other Jane Hamilton books: Map of the World and The Book of Ruth. I read them a very long time ago, but remember thinking The Book of Ruth was okay and that Map of the World was better. 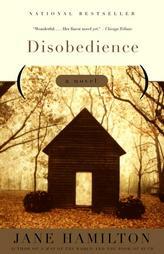 This book, Disobedience, just didn't do it for me. I did like that it was told from the perspective of the teenage son and that the reader gets to see an extra-marital affair (via email) from the child's perspective. However, I just didn't see where the book was going so I had to stop reading. YA books were beckoning me from the library shelves. I am interested to hear what my book group members think of this book when we discuss it next week. I read this one many years ago, but it was not memorable or one I would recommend, so I can understand you not finishing it. I guess this one just wasn't IT, then. I'm not sure what to make of it from the synopsis, maybe it won't work for me either.